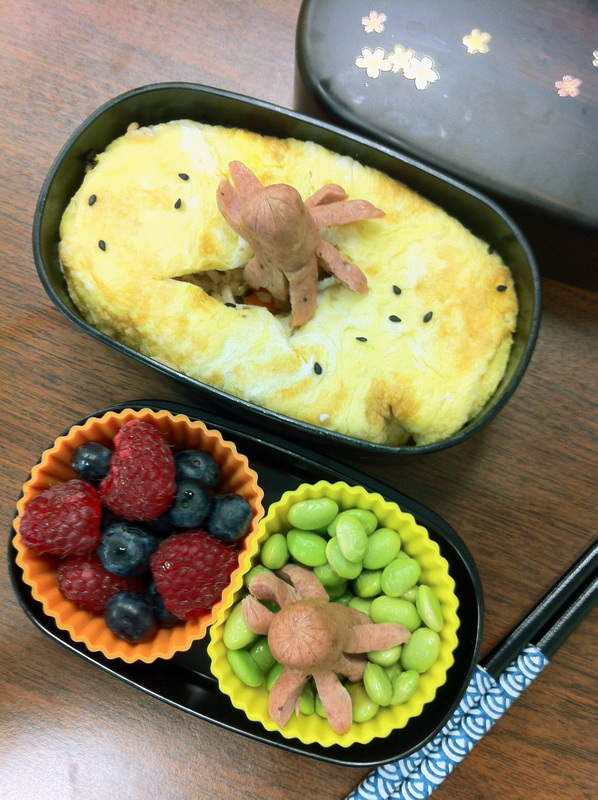 Chicken sausage octopi invade unsuspecting bento box, feasting on the kimchi omu rice, edamame and fresh berries inside. As I’m going through a Japanese cuisine cooking phase, I’ve been studying up a lot on the subject, watching video series on YouTube, like Cooking with Dog, and pouring over my favorite Japanese cookbooks in the tub (favorite pastime). I’ve realized that sometimes I’m not sure if something is Japanese or Korean … For instance, the above-mentioned omurice. Now, I first ate the omelet-over-fried-rice dish while studying abroad in Seoul. We would slather ketchup all over the tasty egg and then dig in with one of those long, wide Korean spoons down to the steaming rice below. But then, I look in my Japanese cookbooks, and there it is: omurice. So which one is it? 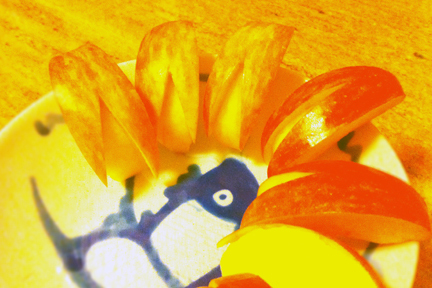 And then there’s the matter of rabbit-shaped apple slices. My mother made these for me my whole childhood. It was the only way I would eat apples, which I never much cared for … Even today, I never eat apples (thought I do love apple sauce, juice, pie, etc.) But I guarantee that if you slice an apple up like a bunny, I will finish the whole thing! Then, earlier this year, I discovered the apple bunnies in the pages of The Just Bento Cookbook, which states that all Japanese kids grow up knowing and loving these tasty treats. What? They’re not Korean? How can that be? A plate of apple bunnies, just like my mom used to make. I ate the whole thing. But I guess growing up where no one else’s mom packed apple bunnies in their lunches, much less roasted seaweed squares and stinky kimchee, I had no one to compare with … There wasn’t another Korean kid in my class until high school and certainly no Japanese! I guess in the end, it doesn’t matter whether apple bunnies or omurice originated in Japan or Korea. They’re still a part of what I see as my amorphous and ever-changing Asian-American culture/identity. But I’m still curious who invented them. This entry was posted in Bento, Family, Food, Japanese Cuisine, Korean Cuisine and tagged apple bunnies, bento box, edamame, kimchee bokum bop, mini sausage octopuses, omu rice, omurice, Taken with my iPhone.